The output shaft support has a round steel anchor that replaces the swingarm pivot nut. The plate slides over the steel anchor and bolts to the cases with the bolts provided. An extended snout countershaft sprocket bolt then rides in the bearing fitted to the plate. This supports the end of the transmission output shaft preventing broken shafts and engine cases. A longer clutch pushrod is included in the hand clutch models. 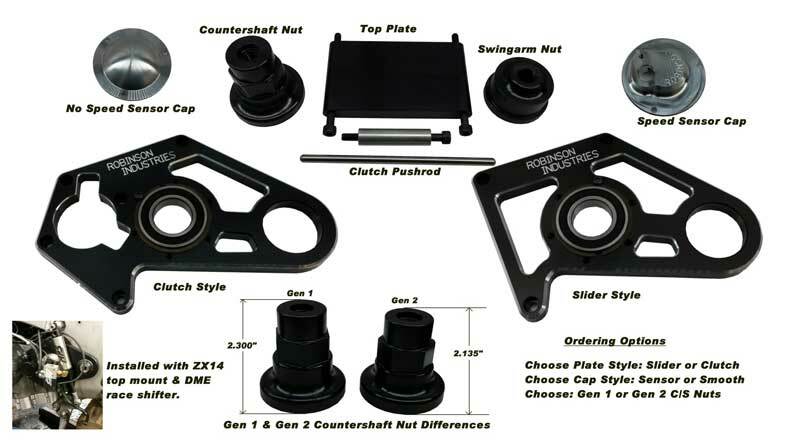 The output shaft support has several options. First, Slider or Hand Clutch version. Then speed sensor or no speed sensor. Busa needs to specify Gen 1 or Gen 2 also. If you have a “grudge bike” you need one of these! You must order by 4/30/2019 at 11:59 PM and mention Dragbike.com to get the special!